I am not dead, it just FEELS like it. With some form or another of SICK since Christmas I have not been up for much in the way of crafts or blogs (or leaving the house or work or cleaning or anything I should be doing). I am getting BORED out of my mind and with this latest round of Bronchitis I have had JUST ABOUT ENOUGH! So out comes the thread and back into the abyss of stitch I go. I made a rather LARGE order of DMC thread that I am now winding onto the never-ending bobbins of doom. This is my organizational tool of choice. I also make sure to put the number on there (cut and taped from the DMC packaging just as Mom taught me) and put into a plastic case. I previously had them organized by number which is essential if you are making complicated patterns purchased by other people but since I am making my own the next step is going to be reorganizing them by color. It’s like reorganizing your record collection in different ways – I do that too! See – I need ALL THE THREADS! 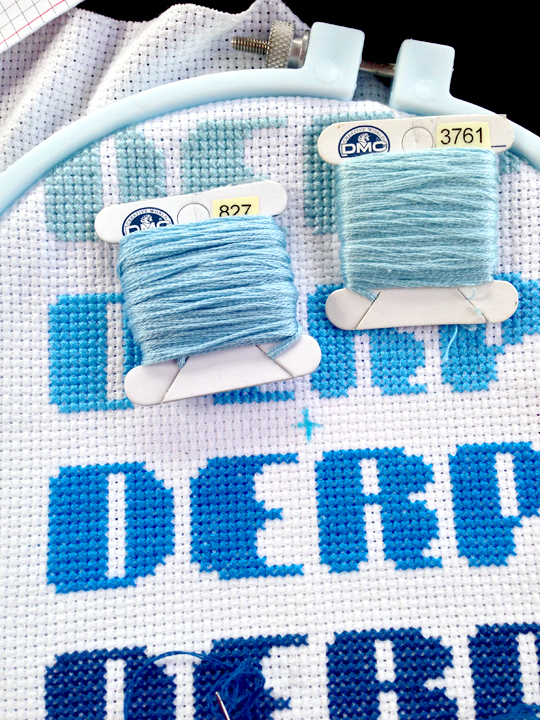 I have worked on my DERP piece FOREVER! I lose interest and then I put them away. There was something bothering me about the colors I picked. The top DERP didn’t work. It was this light dirt teal and now that I see it stitched with the others I DID NOT LIKE IT. I, at the time, did not have a better option. Since I ordered almost EVERY COLOR DMC MAKES I have already spotted a more worthy candidate. The 827 is a better match than the 3761 that I was using. So now I get to RIP it out. This is a satisfying sadness, if that makes any sense. It also takes twice as long to rip out my work than it did for me to put it in. 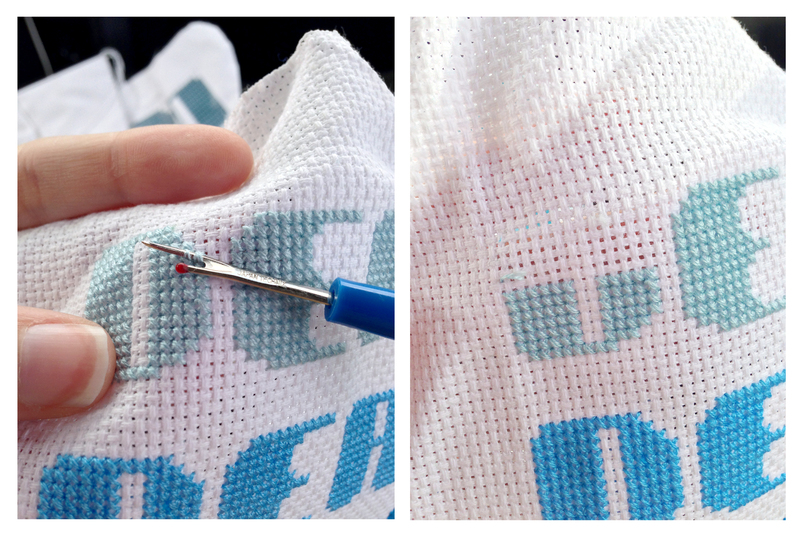 I use a seam ripper, and I go slow to be sure not to grab and rip the cross stitch fabric underneath. Tear, shred, pull, rip. Coming soon – finished piece and a pattern, maybe. If you are lucky.